Sometimes observation of the bunion is all that's needed. A periodic office evaluation and x-ray examination can determine if your bunion deformity is advancing, thereby reducing your chance of irreversible damage to the joint. In many other cases however some type of treatment is needed. Early treatments are aimed at limiting the progression of the deformity and easing the pain of bunion or an associated joint. Conservative treatments such as orthotics can achieve this but they won't reverse the deformity itself. These options include changes in shoewear. Padding. Pads placed over the area of the bunion can help minimise pain, but will not stop the progression of the bunion. Activity modifications. Avoid activity that causes bunion pain, this could include standing for long periods of time. Medications. Nonsteroidal anti-inflammatory drugs (NSAIDs), such as ibuprofen, may help to relieve pain. Icing. Applying an ice pack several times a day helps reduce inflammation and pain. Orthotic devices. Orthotics are the mainstay of non-surgical treatment for bunions. Surgical options, such as a bunionectomy, can remove the bunion and realign the toe. There are several types of surgeries to fix the bunion. 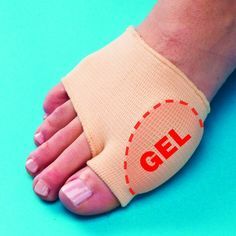 The type of bunion you have along with other factors such as the degree of severity and underlying cause of the bunion will determine which approach would be most beneficial for you.